After nine years in the making, the iconic Philharmonie de Paris has opened its doors. Numerous collaborators were involved to bring this mammoth project to fruition, which is now viewed on the world stage and one of the best in its class. Dominated by the Grande Salle, with five, ultra-modern rehearsal rooms, one large enough to accommodate audience seating of up to 3,400, as well as recording facilities, the venue was a huge project involving a number of manufacturers. 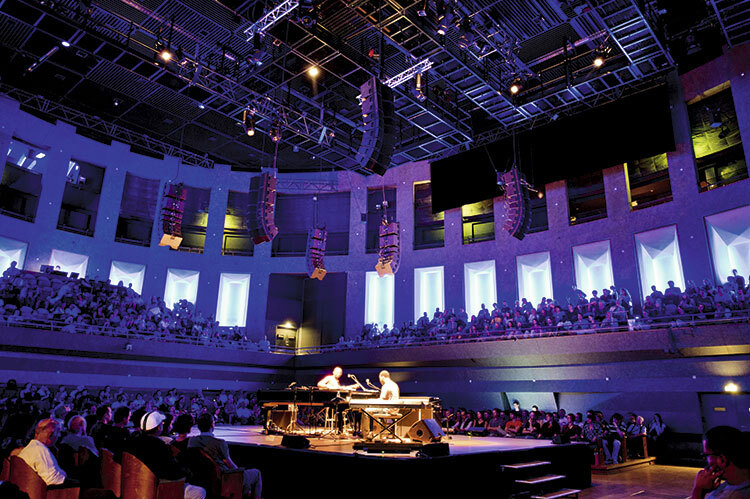 “In the concert hall, the acoustic requirement has a noise rating of 10. As a consequence, all scenic equipment inside the house had to be silent, without any noise from so much as a fan,” explained Jean Francois Mathais, a consultant with dUCKS Sceno, who worked on the project from 2007, developing the design of the auditorium alongside dUCKS’ Scenographer, Michel Cova and Sir Harold Marshall’s team from Marshall Day Acoustics. “We chose sine wave dimmers to have no lamp filament noises and traditional spotlights, instead of moving heads, to remove the possibility of fan noise,” he continued. “After studying fixed installations for classical concerts, and with experience of designing the lighting for that Danish Radio Concert Hall in Copenhagen, we decided on 50 ETC Source Four ETC PARs 750W floodlights, installed in a mobile acoustic reflector canopy to ensure basic light for orchestra, which works like a shower from directly above the stage. 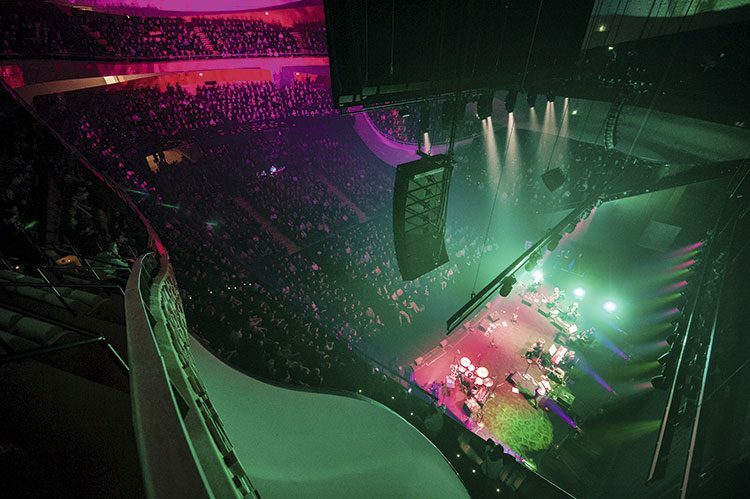 In terms of the audio, the flexing aspirations of the Philharmonie de Paris needed to be accommodated by L-Acoustics. Collaborating with a range of suppliers, they developed the acoustic performance of the system as a whole, through loudspeaker selection, placement and control interfaces. Arnaud Delorme, Application Engineer with L-Acoustics, remembered: “The first idea was a Kara system, perfect for a classical music, but it evolved to a K2, variable curvature line source system to accommodate world music or pop music. 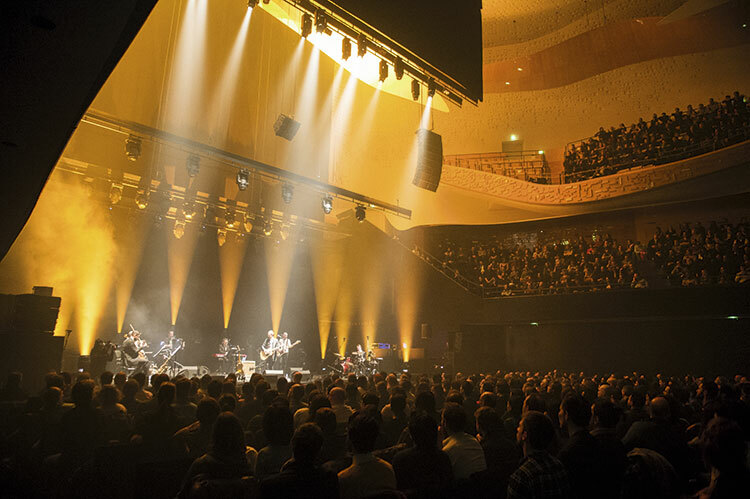 From the start, Philharmonie de Paris was confident that the system would achieve the consistent coverage needed for world music shows, meeting predictions made in our Soundvision software. But then, we met the challenge of accommodating pop or rock music in a venue acoustically designed for philharmonic concerts. Such is the strength of the L-Acoustics range and the supportive, multi-party collaboration, every item supplied came from the company’s standard range, without requirement to adapt any items of hardware. In addition to the audience-facing stage configuration, the L-Acoustics installation is complemented by three side-stage SB28 cardioid subwoofers for strength of impact and two further front-sited SB28’s to ensure homogeneity of coverage. Perhaps one of the most intense relationships to develop as part of the Philharmonie de Paris project was that of Amadeus, with the venue team, led by Technical Director, Jean-Rémi Baudonne and the architect. So intricate was the problem presented, and so concerted the effort to provide solutions, that Amadeus ultimately developed a new speaker range, the PdP Series (PdP stands for Philharmonie de Paris), to ensure that form perfectly met with function. Nouvel also joined with Amadeus to create the Philharmonia, a new studio monitor speaker, strikingly curved and made of 547 wood veneers, each meticulously machined and assembled. Decisions on procuring a range of microphones and configuration of those provided conformed not only to the highest standards of quality, but also meticulous scrutiny of where exactly they could be placed. Once again, remaining unobtrusive, if not invisible, was key. Christophe Bonneau, Product Manager of Audio2 Distribution, was the point of liaison between a consultant crew from Paris’ Salle Pleyel, the Philharmonie team and microphone brand, DPA. Other microphones in the inventory include Shoeps, Sennheiser, Neumann and Shure. Between the Anglo-French set up of Solid State Logic and Rastatt-headquartered Lawo, the venue’s monitoring and mixing console requirements have been comprehensively covered, spanning the technological advances that occurred over the nine years from inception to launch and what might be yet to come. 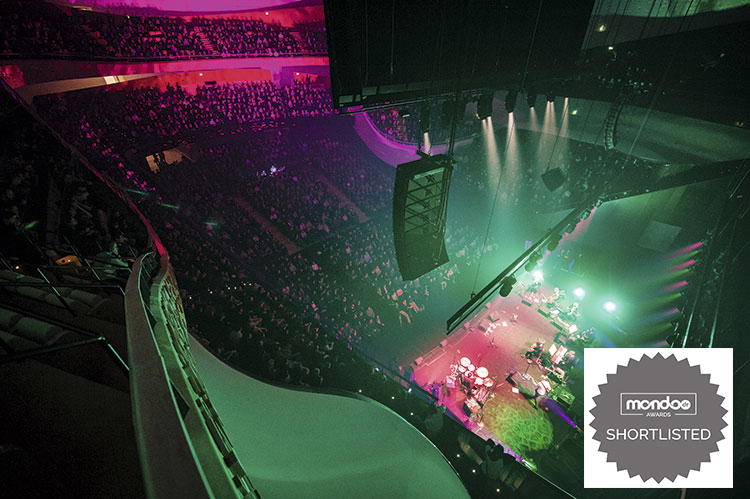 Merging Technologies, developers of the Pyramix virtual studio system and MassCore audio engine joined the venues enviable line up of technical thinkers to help develop the Philharmonie de Paris’ recording, production and digital distribution set-up. Installing four Pyramix MassCore DAWs in every studio set up for recording, equipped with Horus AoIP converters, Merging provided the bedrock of a powerful point-to-point network that allows every microphone in the building to come into the command of one recording or monitoring console.